It’s been a while since I’ve written a review of one of Exposure Wrestling Entertainment’s shows. But now I’ve managed to push myself out of my ever busy university schedule for a three day weekend of wrestling shows. The other two will be talked about at a later date, but the first stop is back to the Pill Millennium Centre in Newport – despite recent reports of the area surrounding it being declared a Red Light District (avert your eyes children), I wanted to see how things were going, and boy were they busy at this show! 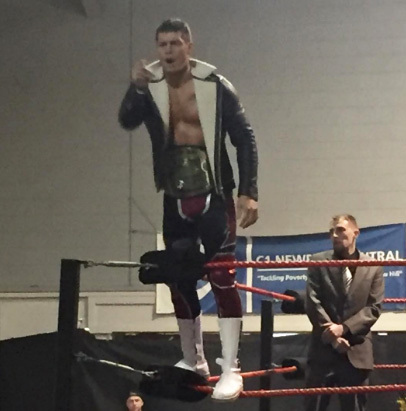 There were a few guest appearances booked from the likes of TNA Superstar Robbie E, Former TNA/ROH star and British veteran Doug Williams, and the main reason people were talking about this show; the appearance of the former WWE Superstar, Cody Rhodes, who has recently appeared for places like TNA, ROH, NJPW, GFW, PWG and WCPW!! Or I suppose it’s just ‘Cody’ now considering the rights to the Rhodes name with him are a bit subject in discussions. So for this review, I’ll just refer to him by his first name. 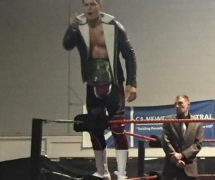 He faced Doug Williams for his newly won Global Force Wrestling NEX*GEN Championship. And not to sound disrespectful, but up until that announcement a few weeks ago, I forgot GFW was even a thing that existed. At least with him as their champion they will receive greater recognition. There are also EWE regulars Axel Carter, Chuck Cyrus and Lion Kid, the ongoing Valkyrie Championship tournament and other things as well! So going into this show people seemed pretty hyped up to see Cody and the others. The show opened with the ring announcer coming out to a Christmas tune dressed up as an elf. They got the crowd hyped up and soon a familiar face of the holidays appeared from the back to greet all the little boys and girls. Yup! SANTA!!! Father Christmas himself came to the ring with Axel Carter and a little person, and they had a laugh before two guys in Welsh Rugby Union shirts appeared from the back and got in their faces. Axel decided to take action before they could hurt Saint Nic and his friend by super-kicking one and throwing the other out of the ring. The little person then pinned the knockouts out prat boy inside the ring for an ‘unofficial’ victory. Again, it wasn’t an official match, but it was a nice moment that had a good amount of people in the crowd smiling and cheering. Also a quick mention, there were more speaking moments in this show, but sadly there seemed to be a problem with the audio from the microphone they had and I couldn’t make out what everyone was saying very well, even with me being in the third row from the ring. So I’ll try and put two and two together as I describe the events that took place to the best of my abilities. This match gave debuts to two competitors from the Knockout Pro Wrestling Academy in Caerphilly, that being the nasty duo of L.D. James and Jay Roberts. They faced the team of Axel Carter, who was just seen not too long ago, and his mystery partner of ICW’s Kenny Williams. That pick shocked me and it was a delight to see him compete as I always enjoyed his matches from the two ICW shows at the Tramshed. This was how you’d expect it to go, the much larger James and Roberts being aggressive and heavy-hitting in their offense, using whatever cheap trick they could think of to get the upper hand. Axel was on the losing end of this beat down mostly, but he had the willpower to push on through the paint and let Kenny use his arsenal of quick paced manoeuvres to get the better of the opposing team. There were also a few ‘fat’ insults at the expense of Roberts, who did not take kindly to all the little kids calling him that. The ending came after a super-kick (Axel) / Bicycle Kick (Kenny) combination on Roberts for the pinfall victory. This got the people even more excited to see what else was coming up next on the show. The next match was one of the MANY ongoing Valkyrie Championship Tournament matches, but I need to point this out before I carry on. I believe this tournament started shortly after LuchaMania so I haven’t been keeping up with it, but it’s basically a tournament of different women, all competing to become EWE’s first ever women’s champion, which has been nicely titled, the ‘Valkyrie Championship’. As of right now, I believe the names who have qualified in the tournament are Nadia Sapphire, Ayesha Ray and Jamie Hayter. Alpha Female and Chardonnay also competed to a double count out, so both of their places are up for debate to my knowledge. This was an interesting match as it showcased two women I’ve never seen before. Lizzy seemed to have the crowd won over from the moment she entered the ring with her genuinely adorable looks, getting a few whistles from the older guys in the crowd (PLEASE TELL ME SHE’S OF AGE!) And then you had Amarah, who was the complete opposite, but in the best way possible. She came to the ring like some type of deranged shaman, jittering around the ring, glaring into the eyes of anyone in her line of sight with her piercing white eyes. She also kept laughing to herself while speaking/chanting in another language, like she was trying to summon divine powers to help her win her match. It was very jarring, but at the same time super interesting to watch. The match between the two was fine with Amarah showing a weird offence mixed with strikes that were both heavy and stiff. But Lizzy was able to hit back with strikes just as powerful. She had the people on her side throughout the match and everyone gave her as much of their support as she battled this witch of the wilds. But unfortunately it was the voodoo queen who ended up winning the match after hitting a Chokehold STO and then a running splash on the grounded Styles for the pinfall victory. After winning, she merely rolled around in the ring, laughing to herself, before taking her voodoo staff and departing the Pill Millennium Centre. Lizzy still got a lot of support from the people, just about everyone clapping and whistling at her even in defeat. The people really do love this girl it seems. Before the next match began, we heard the theme of Mr. Massive himself, that’s right… Chuck Cyrus! People seemed to be mixed to him when he first entered, but after mocking people who were a different kind of ‘massive’ in the crowd and mocking his opponent for the night, Jack Jester, their opinions of him soon changed. Jack Jester came out next and had a few cheeky words for his opponent. But he also said that their match would be ‘No Holds Barred, Falls Count Anywhere… A Newport Street Fight!’ or at least that’s what it sounded like he said, cause again, that audio… not great sadly. But then again, these matches mean the same thing anyway, so let’s call it a Newport Street Fight for patriotism sake. This match was hectic to say the least. There were a few comedic moments from Chuck, but they didn’t last long as he wanted to make sure he did whatever it took to defeat Jester. But just like with anyone else in this type of anything-goes-match, Jack didn’t make it easy for Mr. Massive. After some brawling around the ring, a steel chair was brought into the mix. Not long after when they were outside again, HE USED A CHRISTMAS TREE AS A WEAPON! TWICE!! There were two set up by the entrance so he used one of those twice to do some damage to Cyrus. NOT. FUN. The two would also brawl into the crowd, around the merch stands, and even started throwing each other into a shutter door behind everyone. The action was brought back into the ring where a few moves were traded between the two involving the steel chair from the earlier. But when it seemed Jester would win after setting up a chair in a corner between two turnbuckles, Chuck pulled a schoolboy pin while holding Jack’s tights to get the cheap pinfall victory. Even though the people were not happy with this method of victory, Mr. Massive was ecstatic! He danced for a bit before offering a handshake to Jack with a devilishly smug expression. Jack did grab his hand, seemingly accepting it, only to throw him into the set up chair in the corner. So, despite Chuck winning the match, it seemed Jack Jester ended up getting the last laugh. I wonder if this is the last we’ll see of these two? Jester celebrated with some of the people in the crowd as we headed into intermission. Xia Brookside was a fresher face for me in this match. A very similar demeanour to Lizzy from earlier, except with a little bit of bubbliness and a ton more pink in her blond hair. Kat Von Kaige however is the familiar vintage villainess that she always has been. She dominated Xia throughout a good portion of the match with many different strikes and showboating to boot, which the crowd didn’t take too kindly to. Xia, being the underdog of the two, kept fighting back with everything she had, getting a few big manoeuvres on miss Kaige to push her off guard. In the end however it didn’t workout for miss Brookside as ‘The Leading lady of Professional Wrestling’ hits her ‘Goodnight Sweetheart’ (aka the Widow’s Peak) and scored the pinfall victory. Similarly to the other women’s match, the crowd weren’t too happy that another nasty Valkyrie advanced in the tournament, but still showed their support for the defeated Xia Brookside. The next match was originally supposed to be Austin Osiris against Lion Kid, and it seemed that way. But at the very start of the match, Austin’s fellow ‘Rich Kid of Instagram’, Johnny Narcissist (I wish I was joking, that is their actual team name… end my life), interfered, which didn’t sit well with one of my favourite Exposure guys, mainly due to his Lion King theme and all. He got the half busted mic to say something along the lines of him knowing something like this might happen, so he got some help to keep the rich kids in check, and make this a tag team match. And Lion Kid’s partner… BOOM! TNA’s own Robbie E! The people were overjoyed to see the ever charismatic Robbie E appear to team up with the just as loved Lion Kid. The Rich Kids of Instagram throughout the match showed just how arrogant they were in just about every move they hit, while also providing some comedic moment when they were on the losing end. The Lion Kid got most of the beat downs in the match, but he was still able to hit a few impressive displays of high risk prowess when he had the opportunity. Robbie E was the driving force of the match, practically steam rolling through Osiris and Narcissist. The ending came when Lion Kid hit an over the top dive from the apron onto Johnny on the outside, while Robbie hit his Boom Drop on Austin to get the pinfall victory. The heroes once again emerge on top, with the crowd in full support for the EWE regular Lion Kid and the guest appearance of TNA’s resident Bro Robbie. This was the biggest way to close the show and the people showed it. While they showed respect for Doug when he first entered the ring, this was drowned out by the HUGE ovation that the Grandson of a Plumber did. Cody came out to the ring, and without even realising it, we had ourselves a GFW NEX*GEN Championship match! Cody even had a few ‘Bullet Club’ chants, referring to his recent inclusion in the group after joining its ranks when he signed up with New Japan Pro Wrestling. The two started the match with some beautiful back and forth, though Doug ended up having the edge over Cody when it came to mat wrestling and submission holds. The veteran’s cocky side did show more than once, which the people weren’t too thrilled to see. But this didn’t keep down Cody as he fought back with the people firmly behind him every step of the way. He had many moves in his arsenal that threw Doug around for a loop. But seriously, these two in this match were SO GOOD, I’m really glad I ended up seeing this match as the two just played off each other SO WELL! Towards the end while Doug attempted his Chaos Theory finisher, the ref got knocked down, which led Doug to using this as an opportunity to hit Cody in the head with his own championship belt! When the ref came to his senses, he went for the pinfall count, but Cody kicked out at two! Doug was in disbelief and the people were only more engaged as they wanted to see ‘The American Nightmare’ come out on top. In the end it was a Cross Rhodes executed on Doug that ended Doug’s fate. Then we get the three count and Cody retains his championship! There was also a moment where it looked like Doug would lose his temper on the younger competitor, but instead, he offered his hand out to him, the two shook and then hugged. This was still very humbling to see and it put a very happy end to a very happy show.